Action: Choose a character. If that character is ready, exhaust it. If it is exhausted, it goes insane. 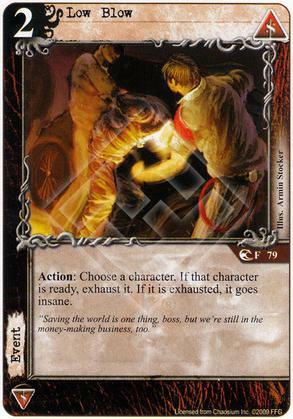 Flavor Text: "Saving the world is one thing, boss, but we're still in the money-making business, too." Should say "non-ancient". Not sure how you deliver a low blow to Nug. Easy. You punch him (it?) in the nuggets. Nice for the flexibility of either exhausting a character you don't want to deal with, or making someone insane (such as after they go into a story). Cost 2 does make it a little less attractive, with options like Pay Tribute and Intimidate out there for cost 0 and 1 respectively with a similar ability. For that extra cost you get the ability to hit an Ancient One, and can make something go insane potentially. Is that extra cost worth those things in your deck? I guess "On the Lam" makes this less relevant, as this is not Tactics and cannot be recurred with Naomi. It's a solid event, but I usually favor cost 1 or 0 events. Might go into a mono Syndicate deck, though. I never see this run anymore as there are several cheaper alternatives.